Dr. DeFoore's Healing Anger Newsletter entitled "Your Anger And Your Health"
Hi, learn how anger affects your health. Would you like to lend a helping hand? If you have purchased a book, CD or audio download, I would very much like to hear what you thought of your product! With your permission, I will publish your comments, with your name, on my web site to help other visitors like yourself learn more about the products. This would be a big help! Some new visitor stories by good folks just like you, who want to deal with the anger in their lives in healthier ways. Check out My Husband Is At Rage Level And Won't Take Responsibility. I think you'll also enjoy Living Next Door To The Love Of My Life. Many site-wide updates and improvements, to make your experience better and more rewarding every time you visit. New images, fewer ads, and rewritten pages to give you more of what you come to the site for--anger management help for you and your family. Visit Goodfinding.com, Dr. DeFoore's other web site. Find lots of positive, upbeat perspectives to help you with your anger management, and sign up for the Goodfinding Newsletter. You can read the current issue of Goodfinding here. Take a look at the chart at the top of this newsletter. Apparently, your heart is listening, and responding to all of your 70,000 thoughts each day. It registers every positive and negative thought and the emotion that they cause. Every cell in your organism is responding to how you feel, what you eat, and how much you exercise. Your choices create an internal environment that is more powerful than your genetics in deciding on your health and the health of your children (and their children). 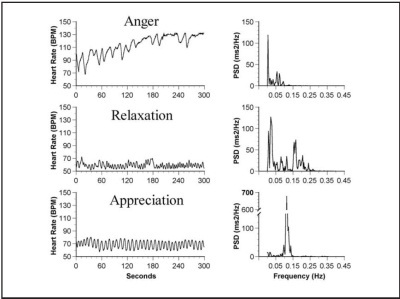 You can see in the chart that your heart gets upset when you're angry, and calms down when you relax. Then it becomes more regular and strong when you go into appreciation. Excessive anger outbursts have been linked to increased risk of heart attack, especially in men. When you go into anger (and there's always fear that goes with that), your entire biological system transforms from "growth" to "protection" mode, which means all healing and rejuvenation processes are temporarily shut down until you feel safe and calm. Read The Biology Of Belief to get a thorough understanding of how this works. The good news is that you can start right now to change yourself for the better. There are powerful tools that you can start using today to improve your emotional and physical health. If nothing else, practice anger management techniques on a daily basis, and your health will improve. Your health and your heart depend on you to make good choices, not only in what you do, but what you think. Take a look at the graph above. 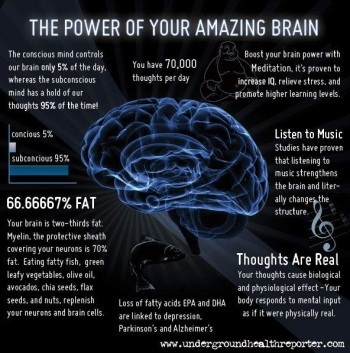 You can see that 95% of your thoughts are controlled by subconscious processes. The techniques listed below will help you gain control over these subconscious processes, so that you can have lasting anger control and continuing happiness. Make up your mind (and your good heart) to get a handle on your anger, using this powerhouse of tools, or if you'd rather listen and be guided through the steps, get one of these audio CD/download programs. Get your thoughts going in a better direction (remember how your heart likes appreciation? ), by using this positive journaling process. Watch this video to learn how to "retrain your brain" and "create a new default program" that focuses on gratitude, appreciation and optimism. Subscribe to the Goodfinding newsletter, which will keep you up to date on positive, uplifting and encouraging viewpoints about yourself and the world around you. You can do this, and your heart will help you. Pay attention to how you feel, and your body will guide you to the best choices. It takes courage to be kind. Don't fool yourself into thinking that anger is strong. It's not--it comes right out of fear. Real strength is kindness. This audio CD program, also available for download as an MP3 file to play on your computer, iPod or other MP3 player, will help you understand healthy anger, and how it can help you be healthy and happy, with yourself and your relationships.